Apologies to my internet lovelies. OK, I have a couple of apologies. Firstly, Boo has discovered the joy of commenting. This morning he was watching me on my NaBloPoMo page and declined a friend request. Mad scramble to apologize to said requester and added her as a friend (sorry Lotus) God only knows if there were others. If I declined you, it wasn’t me it was the tiny terrorist on his reign of send-Mummy-round-the-bend. Secondly, he has been randomly clicking on my bloglines and commenting on blogs. So if you have got an abusive comment blabbering on about being pre-pubescent and taking anger out on people he likes…. I am deeply, red faced embarrassed SORRY!!! I have not finally snapped. I haven’t changed my name to Harry Potter, Homestar runner or any of the other alias’ he has assumed to slander his poor mother. especially when people wear them in the office. It is a running joke that people scramble to see my reaction when someone (yes I am talking about you Marie) walks in with them on….. with a freaking skirt…. Anyway, I was apologising…… I am sorry if they are your footwear of choice. I am sorry if I offended you. I am sure that you feel that you are the height of fashion and my poor choice of footwear will send me to the podiatrist in years to come and you will be able to wear your, um, shoes right up to old age. more emails having a go at you? I’m stunned, shocked and dismayed!! No, seriously I am! It’s a blog for goodness sake not government policy! To those with nothing better to do with your time that write horrid emails to nice ladies in splendid shoes, go complain to someone who deserves bitching at and leave Kelley alone! I will admit to owning a pair of fluffy slippers like those pictured…….. mine are blue and white…. but they only leave the house if I am very cold, in need of comfort and wearing jeans lmao! Well I musta missed something here. What did you say about ugg boots? Weren’t we supposed to just look at the pictures???? I went back and read the bits in between and I’m still lost…. maybe I need to go back to school and learn how to read. LOLOL. You know what? Now that I have a wordpress account – this thing keeps leaving me signed in. Not that I mind people reading my wordpress blog… just hadn’t planned on *sending* them there from my comments. http://lightening74.blogspot.com . Just in case anyone cares! LOL. You know what? The more I look at those lovely fluffy slippers….the more I want a pair. I just had a stroke of genius!!!! I could wear them when you and I go shoe shopping!!!!! Mwaaa-haaaa-haaaaa. We might even get a “sympathy discount” that way. LOLOL. Well…. they DO look rather cosy and warm and I do like pink! You have got to be kidding me, they sent you emails.. They are ugg boots, and i have much the same view. They should be a at home thing only. Never a work thing, or shopping thing. And SHOULD never be warn at a night club, what are you thinking… they are not a fashion statement.. They should Never Ever be worn outside of the house. Ever. Wow I thought I was the only one who found them so… well so for only home wearing. LOL. Here’s to high heels even if they do mean I will be crippled when I am old and grey. No. Those just aren’t proper uggies. They look like they’ve never been near a sheep! Sheepskin only please, and woolly on the inside! And natural colours only. Seen in Sydney in the middle of winter: chick in teensy pink parka, with bare midriff, short pink denim skirt and pink uggies. Oh well, at least her toes were warm! LOL why do people send abusive emails, that makes NO SENSE AT ALL! Be brave people, post it so the rest of us can see it too or dont be surprised if the blogger posts it for you. Everyone is entitled to their own opinion but they dont have to be abusive about it or try and shove it down other peoples throats and Kelley certainly isnt forcing you to read her blog, so why be abusive to her?? As for uggies, i love my uggies, i wear them mostly in winter as we dont have any heaters and this last winter with no carpet (floorboards with gaps let a really nasty breeze in and i am up all night studying)my uggies were a godsend. I on occasion wear them out of the house, especially first thing in the morning in winter when i am ready to go to bed and have to drop DD to school, its the uggies or bare feet. But i also agree, most uggies are not designed to be outdoor shoes, they are definitely not officewear, and those fuzzy things in the pic, well we call them monster boots. And they are not even soft, they are harsh feeling unatural things, at least if they were soft maybe they would be nicer, but i prefer the fuzziness of my sheepskin uggies next to my skin,not on the outside of the boots. Oooh and Kelley, the high heels wont necessarily make you crippled when you get older, just remember to stretch your achilles tendons regularly (sit on floor with legs out straight and pull toes back til feet are totally flexed and then pull just a bit tighter so it gives the achilles tendons a nice stretch, also very good for calves and thighs) and you will be fine to wear your heels every single day until you get really really elderly and then have to go to special shoes (which everyone does eventually, the only heels worn in nursing homes are by the secretarial staff). I know one little old dear in her 90’s still wearing heels at least 2 inches high, hasnt stopped her doing anything and she is in a self care unit, she is still fully functioning. I cant wear the stiletto pointy heels (my ankles wont put up with it) but i love the big chunky heels, doesnt matter how high the heels are as i walk around on my toes all the time anyway, just as long as the heels are decent incase i need extra balance etc. Keep posting your opinions Kelley, there are more of us that enjoy reading them than there are abusive people! Oh and Ellen, i am sure i saw the exact same girl several times over when in sydney, in the middle of the rain on the docks in circular quay, all with mini skirts, bare midriffs and bright pink, purple or blue uggboots, even one in those fuzzy monster boots in Kelleys pic. 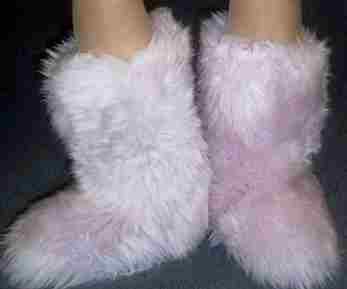 Hehe i may be a countrybumpkin/feral and wear jeans, flanny shirt and ugghboots to drop dd to schoo, but even i was shocked to see fuzzy pink monster boots in the middle of circular quay..
Oh and Boo i am deeply offended, you didnt leave me any comments! Those pink fluffy things get worn to the office?? But they’ve got no proper sole or heel or eye appeal…….Definitely house wear only. I’m a sneakers girl myself because I’ve got wide feet and a bad back so no high heels for me ever. Previous post: Ok already….. here they are! Next post: How to get a squeaky clean arse.